Low-lit dark rooms can raise a multitude of paint colour challenges. As the day progresses, these rooms change from dim to dark, as the lack of light can make a room appear smaller in dimension. Despite the fact that our natural instincts instruct us to use a light colour in dark rooms, there are actually alternative options which could produce brighter results. Pastels and light colours can actually result in an uninviting atmosphere as they attempt to reflect non-existing light. But dark rooms are the perfect opportunity for fun, daring and vibrant colour play. Explore brightly saturated colours that add glow. Rich and saturated hues can create a colourful atmosphere that radiates. This becomes the perfect substitute for the lack of natural light. Lime greens, rich blues, popping violets and glowing tones of orange can create life in any room with a burst of individual personality. A lime green is a refreshing burst of energy for dark rooms of all sizes. 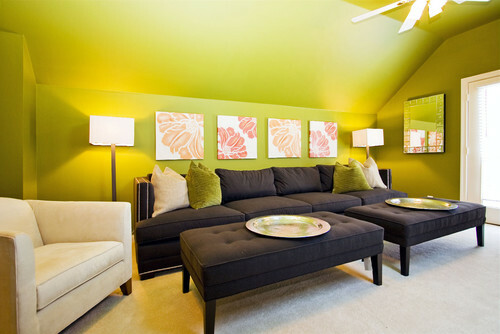 Though it’s usually seen on accent walls, a dimly lit room makes a perfect case for all four walls to be lime. It’s an ideal way to cheer up dens and living rooms that are in need of a vibrant effect. It helps you to walk into the room and feeling revitalised. Don’t be afraid of beautiful, bold oranges. They create the attention-grabbing effect of red without the over dramatic effects. 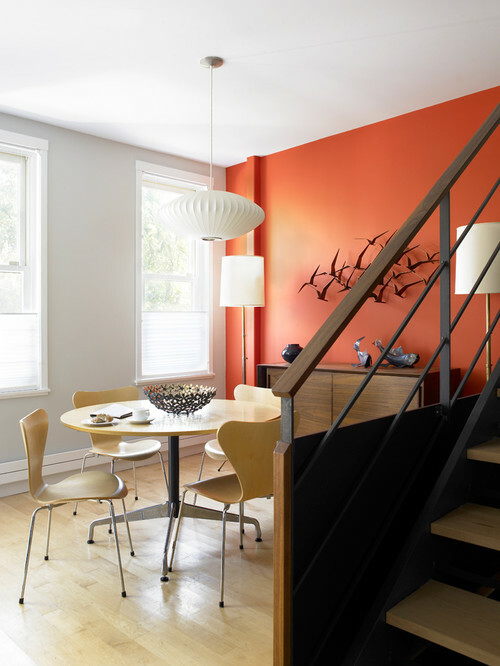 Since they contain hues of red, they posses a warm yet bold effect in this dining room photo. The colour used here also picks up tones from the wooden stairs and adds glow throughout the day and night making the perfect way to add warmth to a room. It also creates a comforting atmosphere as a colour that is easy on the eyes. Purple can add a whirlwind of charm and character to an all-white bedroom or living room. It can add personality, style and modernity – plus put a smile on your daughter’s face every time she enters her gorgeous new purple room. Designing with blues creates a welcoming and peaceful feeling. Since blues go well with either light or dark colours it gives you the chance to further explore room décor options of all types. 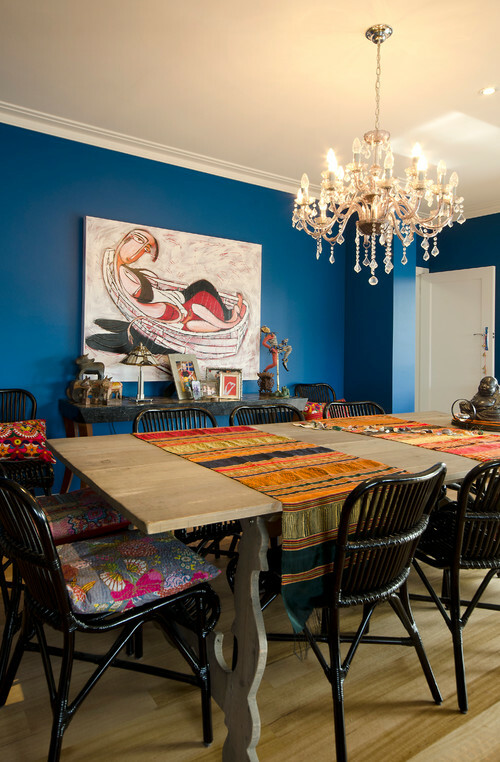 The blue in this photo makes the dining room feel alive by adding a splash of life in a soothing way. If you’re still undecided, curate a bright colour palette with combinations that intrigue you. 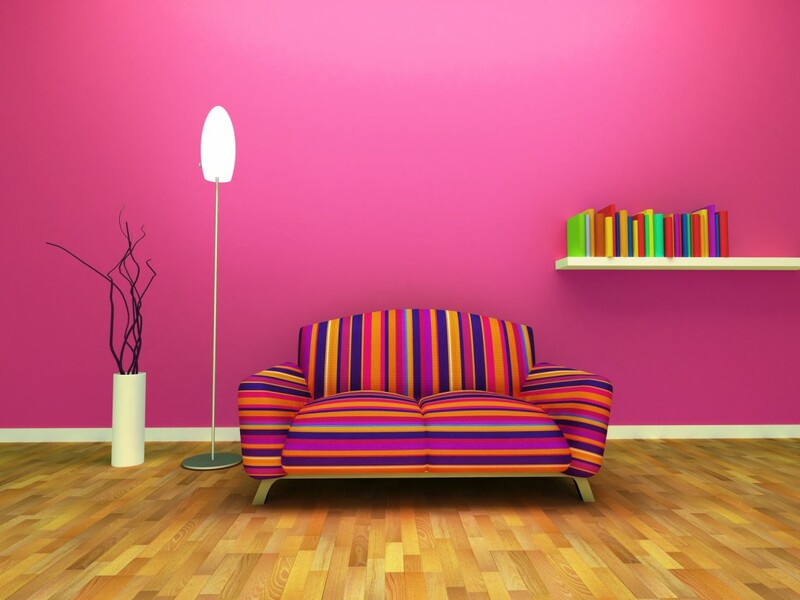 Remember that colours are more than visual – they also establish moods. Choose a colour that resonates the mood you want your room to represent. Remember: paint samples are really helpful in securing right decisions. But when you (or your handyman) paint samples on the wall, remember to paint them at least one metre apart, as our eyes tend to blend colours together. Choosing paint colours is confusing enough – so don’t make it even more confusing.